This is the second scroll in a series created for a bonsai display. The sumi-e painting of the Geese, called 雁 Kari in Japanese, was done by Darlene Dihel, a sumi artist in the Pacific Northwest. I met her several years ago at a Japanese festival, and have done a few projects together. I requested this painting to sell for a bonsai display that has a fall theme. The entire poem and concept will be provided upon purchase. When I bounced this idea off of him, he said it was a good theme, but advised me to design scrolls that are more subdued with earthtone colors. In designing this scroll, I wanted to do a Sandan Hyougu, or three step style scroll. 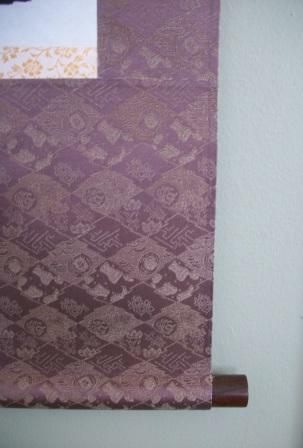 This is a little complex for a display, because most scrolls used for display in the Gadou style are either Maru Hyougu or Fukuro Hyougu designs. I thought the symbolism with this would work, and would be appropriate for certain plants used in the display. The Orange on Gold Ichimonji represents the sunset, the goldenrod is for the dried out grasses along the riverbanks, and the bronze for the turning of the leaves. 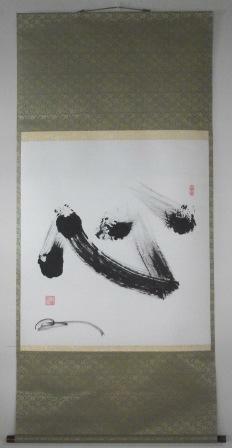 This scroll was accomplished by joint effort of Sumie Artist Darlene Dihel based out of the Seattle area of Washington. I have been working on a planting to display a fall scene of migrating geese. 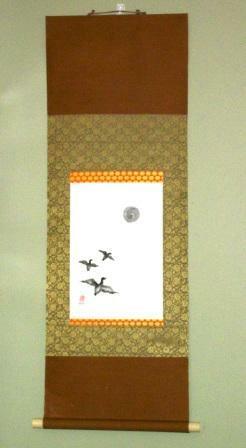 This scroll was completed to vend at an event at Bonsai in the Bluegrass. The scroll has been sold. This scroll is for a gift to the Grandmaster of a Budo system. The practitioner lives in the Western United States. It has turned out to be a very beautiful scroll. The person sent to us a PDF of how they wanted the writing done. You can learn about this martial art system and see a link of the writing and how it is similar at http://www.hoshin.us/index.html Although not an exact replica of their request it is very similar and beautifully done in a somewhat Gyousou style of writing. I call it gyousou because the first character is in the Sousho style and the remaining three would be considered Gyousho style. Yoshimi had to plan very well due to this large piece comprising only four characters. It reads Hoshin Budou. Ho is the most difficult character to translate as it is in a Sousho style, shin is the spiritual heart and Budou is a system of martial arts. I was very pleased with the selection of the cloth. At first the customer wanted a solid purple cloth, which just didn’t seem to work. I showed the customer a small sample of this koi pattern purple and he decided to go with this cloth. It was a wise choice because it really seems to go with feeling of the writing, even though it is a less traditional kireji (cloth) that one sees with martial arts or Japanese/Okinawan karate themed kakejiku. The scroll is completed with the gold on white Ichimonji and a Shitan Jikusaki. The colors really match well. This scroll was ordered by a Student for the Dojo Sensei. There were several students that passed their black belt exam and went in for a gift to the Dojo. The design was done very well and the wallscroll turned out very beautiful in the Navy cloth with the Cream and Large Karakusa (arabesque) pattern for the Ichimonji. The black wood lacquer jikusaki with the Aqua/Silver fleck just seems to let it go in a pattern from lightest to lighter to darker to darkest...I was very happy with the way the scroll turned out and was pleased with the end result. The words are written in a Gyousho style by Ryugyoku Yamada and the meaning is Honor, Discipline and Adaptation are kind of the motto or Dojo Kun. We used more esoteric meaning with one character to represent the words because we thought that would be the better fit for the dojo, which has roots in Japanese/Okinawan based karate but also adapts with different styles. I hope the Sensei likes the time and thought that the students put into designing the scroll. This scroll was a very interesting project. A Buddhist temple/retreat in the mid-southern United States wanted to honor a patron. The top reverend in the Temple brushed this version of Kokoro, and wanted it made in a scroll to be presented to this patron. They wanted a Japanese cloth but wanted a more subtle pattern and design in the cloth. 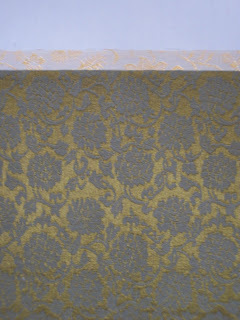 In the end this goldenrod cloth with a small ivy唐草 karakusa pattern was selected. They also wanted a lighter ichimonji, so the gold on white with a very similar arabesque was decided upon for the scroll. The greatest concern to the artist was the trimming of the artwork. The work was on a square of about 230 by 230 bun. The artwork could have been trimmed into a Yokojiku because there was a significant amount of white space on the top. 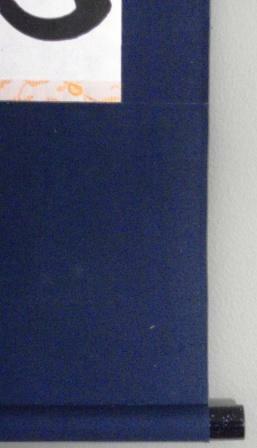 However, there was also a little extra space on the right hand side of the work. We decided to keep the length longer than the width, which was a result of good advice and consultation help from my 表装Hyousou Sensei in Japan. 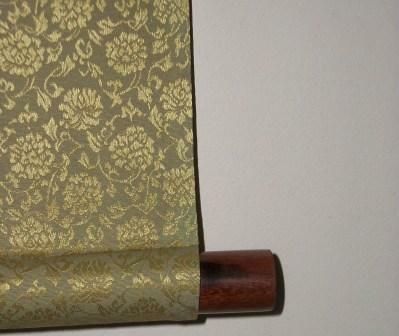 The obvious features of the scroll are the narrow Hashira. This was done as necessity due to the large width of the writing. I did not feel like jointing the cloth as done in the previous Peony scroll at an earlier post. So this was cut from one section of cloth. The second most beautiful feature is the紫檀軸先 rosewood jikusaki. 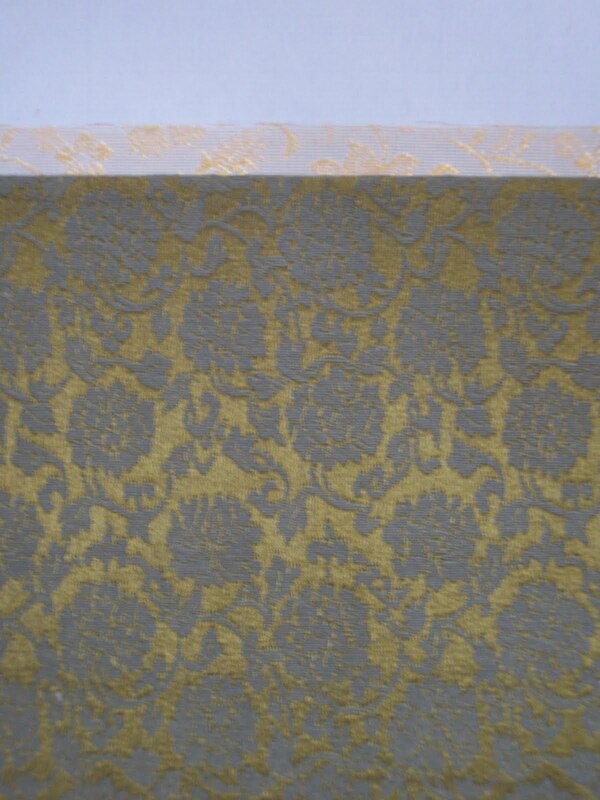 I think this is a beautiful complement to the goldenrod color of the cloth.